Your No 1 Electrical Contractor for Commercial Contracts and Domestic Installations! 24 hour emergency call out 07710 054826 mobile. K. F. Electrical are a small family run business, providing a first class service throughout the UK, using only fully qualified electricians. We can provide a 24 hour emergency call out. K.F Electrical are fully accredited, qualified and approved contractors being members of the NICEIC and Approved Domestic Installers. 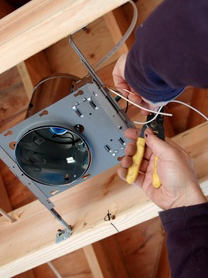 Our reputation as reliable and professional electricians is based on excellent quality of work, competitive pricing and accurate, honest advice to all our customers, both existing and new. All our employees follow the strict AGW working practice guidelines and we are proud of our business standing in the UK electrical industry. We have undertaken commercial electrical contacts and domestic installations in mainly Macclesfield. *Member of NICEIC as approved contractor , also registered as a NICEIC domestic installer and a member of the trustmark scheme.